After arriving and finding the perfect site, we began to set up but unfortunetly our camper had a major issue which made it impossible to use. We returned to the office and the owner actually came to our site to see if he could help us. After trying without success we agreed to camp in the one rental camper they have at the campground. It was a great stay. The office personnel were extremely helpful and friendly...the campground was very clean, facilities top notch, the sites were all very spacious and grassy, and ours had a beautiful view of the lake and the surrounding mountains. The owners went out of there way to make us have a great stay and we highly recommend this campground to anyone looking for a quiet, clean, beautiful place. We will definetly be back for another visit. If you are looking for a peaceful, beautiful campground with great views this is the place! The owners have gone out of their way to be helpful and are a sweet couple. Our stay here has been awesome!! A true hidden gem! The sites are larger than any campground we have stayed at. 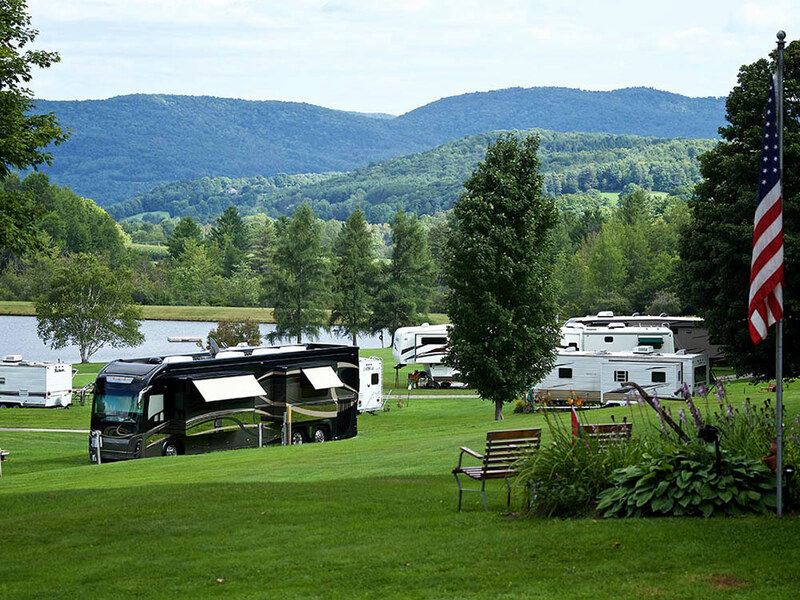 The campground is very well maintained with lots of open areas. The furry "kids" especially enjoyed the open acres of the dog walking area. What a fantastic campground! Quiet, good sized sites, lots of open space and immaculately kept grounds nestled in the mountains made for a great stay. As expected the campground was packed over the Labor Day weekend, but it was still quiet and campers were very respectful of each other. Two reasons I didn't rate them 5 star: poor electric service and speeding. Electric - granted it was unusually hot while we were there so most RV had A/C running, and we were the last site in a fairly long row, but we had issues with low voltage, especially in the early morning. Speeding - there are a number of seasonal and/or long term stay sites at the campground, and while the occupants were all super friendly and their sites very well maintained, they tended to drive very fast through the campground, to the point that I avoided certain areas while walking the dog for fear of being hit. The posted 10mph limit is largely ignored. All in all a great stay and we would definitely stay here again.